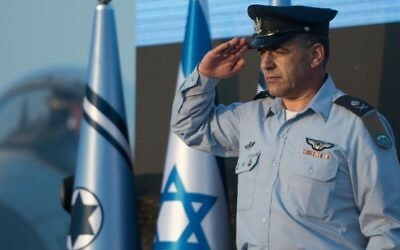 Dozens of senior officers from militaries around the world arrived in Israel this week for a three-day conference organized by the Israeli Air Force, the largest such event held in Israel in at least 20 years, according to a senior IAF official. The focus of the confab is “air superiority as a bridge to regional stability,” the air force officer told reporters on Monday, speaking on condition of anonymity. Over 20 countries were sending representatives, either the heads of their air forces or a deputy, including the United States, the United Kingdom, France, India, Vietnam, Poland, Romania, Canada, Finland, Brazil, Holland, Cyprus, the Czech Republic, Croatia, Italy, Greece, Belgium and Austria. The air force refused to provide a full list of attendees, likely as a courtesy to countries that preferred not to flaunt their military ties to Israel, notably Arab and Muslim-majority nations. The foreign officials were due to arrive in Israel by Monday. “My expectation is that all the air force commanders will understand that the cooperation, the partnership between the air forces, is a bridge to better regional stability,” IAF chief Maj. Gen. Amikam Norkin said in a video statement in English (above). The air force officers were scheduled to hear speeches by a variety of Israeli and foreign officials in the Tel Aviv suburb of Herzliya on Tuesday, including Norkin. The next day the visiting air officers will be flown around the country by IAF pilots. The conference’s main topic — aerial superiority — is one of particular importance, given the heightened tensions between Israel and Iran in Syria, as well as regional conflicts in general, the senior IAF officer said. “The strategic timing of this conference makes for a very interesting opportunity for these air chiefs to see firsthand the regional dynamic that’s going on,” he said. 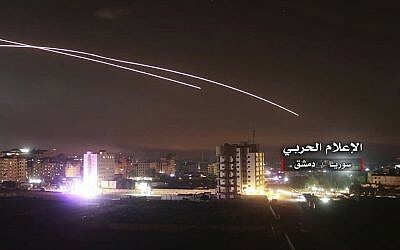 The conference comes less than two weeks after Israeli jets bombarded dozens of Iranian targets in Syria and Syrian air defenses, in response to a large but unsuccessful rocket attack by Iranian forces against Israeli military bases on the Golan Heights. The senior air force officer also noted that it coincides with ongoing, bitter fighting between Egyptian forces and an Islamic State affiliate in the Sinai Peninsula. According to the officer, the prominence and power of the Israeli Air Force and its close ties with foreign militaries are “a source of stability” in the Middle East, helping prevent tense situations from spinning out of control. Israel has long viewed its air superiority as a central tenet of its national security policy. The conference has two main goals, the senior air officer said. The main and most obvious one is to discuss the topic of air superiority with Israeli allies. The second — but perhaps more important — purpose is to strengthen the air force’s and Israel’s relationships with the participating nations. “We’re going to emphasize our technology and values. We see this conference as a platform to build and strengthen our partnerships internationally,” the officer said. “It is our goal to connect these important partners to the State of Israel, to the IDF and to the air force. We see this as a national-level event, even though it’s an air force-level event,” he said. Under the banner of military drills, Israeli pilots are able to do what Israeli politicians cannot. The IAF, for instance, has participated in air exercises with the United Arab Emirates and Pakistan, two countries that do not formally recognize the State of Israel. On Tuesday, in addition to IAF chief Norkin, the conference-goers were set to hear from former senior defense official Amos Gilad, a central voice in Israel’s strategic planning; Danny Shapira, one of the founders of the IAF; Marillyn Hewson, CEO of Lockheed Martin; Yossi Leshem, a renowned Israeli ornithologist who has worked closely with the IAF; US Air Force Gen. Tod Wolters, commander of the US Air Force in Europe; Australian Maj. Gen. Simon Stuart, head of the peacekeeping force in Egypt’s Sinai Peninsula; and a number of IAF veterans who now work in Israeli start-ups. The CEO of Lockheed Martin, which manufactures the F-35 fighter jet, is expected to speak about the importance of stealth technology in air superiority, the IAF officer said. Following the speeches in Herzliya, the conference attendees will travel to the army’s Tel Aviv headquarters, known as the Kirya, to meet IDF Chief of Staff Gadi Eisenkot and receive a briefing from him on Israel’s security situation on top of the Kirya’ main building. They will also travel across the street to the basement under the now-swanky Sarona Market where the Israeli Air Force was founded in 1948. For Wednesday, they were invited to visit the Tel Nof air base in central Israel, where they will meet young IAF pilots and have a chance to fly inside Israeli planes and see the Jewish state from above. They will also meet briefly with Prime Minister Benjamin Netanyahu. On Thursday, the IAF planned to take the foreign airmen to Jerusalem to learn more about the air force’s “heritage” and meet with President Reuven Rivlin, the IAF officer said. The three-day event, held in honor of the 70th anniversary of the air force’s founding, will be the largest of its kind in at least 20 years. “The IAF, for its 50th anniversary, did something similar, but it wasn’t at this scale and it wasn’t with this agenda,” the senior IAF officer said. “We’ve been working on this for a year,” he added. 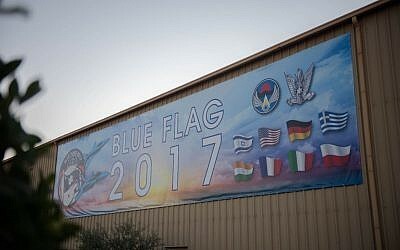 Last year, the Israeli Air Force hosted its largest ever exercise, known as Blue Flag, in which seven other militaries took part. 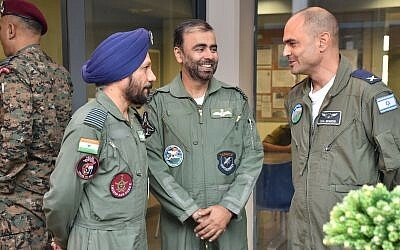 In the November 2017 exercise, Israeli pilots flew alongside counterparts from India, the United States, Greece, Poland, France, Italy and Germany, taking part in mock aerial battles over southern Israel. Some 1,200 people — including commanders and technical personnel — took part in the exercise based in the Israeli Air Force’s Ovda base north of Eilat.